Click here to purchase the Macbeth Guide - Revision made Easy! This section is dedicated to Macbeth, the play by William Shakespeare. The picture is 18th century and image displayed represents the essence of the play which, we hope, will bring to life a famous scene or character from the play. The information provided in this section of william-shakespeare.info includes famous quotes / quotations, summary of the plot or story, facts about the play, a list of the cast and characters and access to the full text - script of the play Macbeth by William Shakespeare. A thunderstorm and three witches conclude a meeting. They decide to confront the great Scottish general Macbeth on his victorious return from a war between Scotland and Norway. The Scottish king, Duncan, decides that he will confer the title of the traitorous Cawdor on the heroic Macbeth. Macbeth, and another General called Banquo, happen upon the three witches. The witches predict that he will one day become king. They also predict that Banquo will beget a line of kings, although will not ascend the throne himself. King Duncan arranges to visit him at his castle. Macbeth cannot stop thinking about the witches' prediction that he will become king and decides that he will murder Duncan. Macbeth's wife agrees to his plan. Duncan arrives at the castle with his entourage but he has second thoughts about the murder plot. The forceful Lady Macbeth holds him to his vow to kill Duncan and further encourages him. She then summons evil spirits to "unsex" her and fortify her with cruelty. He then murders Duncan assisted by his wife who smears the blood of Duncan on the daggers of the sleeping guards. A nobleman called Macduff discovers the body. Before investigation can take place Macbeth kills the guards insisting that their daggers smeared with Duncan's blood are proof that they committed the murderous crime. Duncan's sons, Malcolm and Donalbain, do not believe their father, however, fearing for their lives, they flee Scotland. This makes them appear guilty so the crown passes to Macbeth. He remembers the prophecy of the witches that Banquo will beget a line of kings So he sends hired assassins to murder Banquo and his sons Donalbain and Fleance. Fleance, is the only one to escape with his life. At a feast the bloodied ghost of Banquo appears to Macbeth but to no one else causing Macbeth to act and speak strangely. His wife sends the guests away. Macbeth plagued by the fear of being discovered begins to suspect that Macduff, a nobleman who refused to attend the feast suspects him. He meets with the witches again and they confirm that he has good reason to fear Macduff but they soothe his fears by telling him that no born of woman can harm him. After meeting with the witches he learns that Macduff is urging Duncan's son, Malcolm, to reclaim the throne. In revenge, he has Macduff's wife and son murdered. Macduff organizes an army to bring down Macbeth. Lady Macbeth's conscience now begins to torture her and she imagines that she can see her hands covered with blood. She commits suicide. Macbeth meets Macduff in hand-to-hand combat confident that he will win the day because ''none born of woman'' can harm him. Macduff then reveals that he was not ''of woman born'' but was ''untimely ripp'd'' from his mother's womb. Macduff kills Macbeth and the witches prediction proves true. Malcolm becomes king. Themes discussed are ambition, fate, deception and treachery. It is believed that Macbeth was first performed between 1605 and 1606. In this era there was a huge demand for new entertainment and the drama would have been produced immediately following the completion of the play. Shakespeare knew that a play featuring witches would attract theatregoers and increase his audience and revenue. He would also have been aware that King James I was extremely interested in witches and sorcery, having written a book called Daemonologie (Demonology) describing the demonic rites of witches. Shakespeare really could not lose with Macbeth when it was performed in 1605, two years after James acceded to the throne of England. It is believed that Macbeth was first printed in 1623. As William Shakespeare clearly did not want his work published details of the play would have therefore been noted, and often pirated without his consent, following a performance. The settings are Scotland and England. The quotes from the play are amongst Shakespeare's most famous including 'When shall we three meet again' and 'Is this a dagger which I see before me'. Details of these famous quotes follow, complete with information regarding the Act and the Scene, allowing a quick reference to the section of the play that these quotations can be found in. Please click here for the full text of the script of the play. "There 's daggers in men's smiles". (Act II, Scene III). "What 's done is done". (Act III, Scene II). "Fair is foul, and foul is fair". (Act I, Scene I). "I bear a charmed life". (Act V, Scene VIII). "Yet do I fear thy nature; It is too full o' the milk of human kindness." (Act I, Scene V). "Is this a dagger which I see before me, The handle toward my hand?" (Act II, Scene I). The real Macbeth took the throne of Scotland in 1040, after killing his cousin King Duncan I in a battle near Elgin in the Moray district of Scotland. Duncan's eldest son, Malcolm, ended Macbeth's reign in 1057 by killing him in battle and later assuming the throne as Malcolm III. 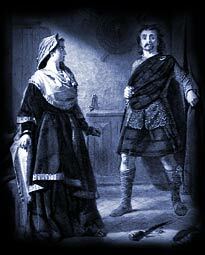 The real Lady Macbeth's first name was Gruoch, although this is not mentioned in the play, and he was her second husband. The Chronicles of England, Scotland and Ireland by Raphael Holinshed. Reginald Scot's "Discovery of Witchcraft" was also believed to be a source of information. Macbeth by William Shakespeare has inspired other works including a film featuring Ian McKellan and Judi Dench. Also the opera by Verdi was inspired by the famous play.